It was a year dominated by worries over ceasefires and attempts to form power-sharing governments. No, not 2005... but 1975! Secret Cabinet papers from that year - as well as some held over from 1974 - have just been released and they show that in the game of peace-making, not much ever changes. Although violence was still the norm - 247 died during the year - there were echoes then of what would follow: an IRA ceasefire, a failed attempt at power-sharing and even efforts to cheer people up with big-name concerts at Stormont. 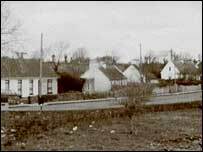 The on-off ceasefire grew out of talks between the IRA and Protestant churchmen in the village of Feakle, County Clare. There were secret talks, but a memo from the permanent under secretary at the Northern Ireland Office (NIO), Frank Cooper, betrayed the government's true intentions. "Our aim is to string the IRA along to the point where their military capacity goes soggy and where Catholic community support disappears," he wrote. Attempts at re-establishing power-sharing were no more successful. In May, elections were held to a Constitutional Convention. 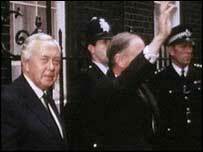 And although the IRA ceasefire broke down in the summer with the murder of four soldiers in south Armagh, inter-party talks began at Stormont under the chairmanship of the Lord Chief Justice, Lord Lowry. The DUP leader, Ian Paisley, wanted the former Stormont MP and leading barrister Desmond Boal for the job, saying there should be no question of an Englishman being appointed. The hardline Vanguard leader, Bill Craig, proposed a voluntary coalition with the SDLP. It is an idea recently floated by the DUP in an attempt to exclude Sinn Fein from a power-sharing executive. But back then, he was not so keen. Craig was roundly defeated at a meeting of the United Ulster Unionist Coalition and expelled. Papers from the time say officials blamed Mr Paisley, claiming he was worried about splits in the Free Presbyterian Church. Enoch Powell also got some of the blame. Mr Paisley, however, told the NIO he would make "substantial concessions - very large concessions" if the SDLP was willing to abandon power-sharing and the "Irish Dimension". 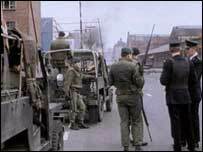 The then SDLP leader, Gerry Fitt, had earlier in the year pressed the government to release paramilitary prisoners following the IRA ceasefire. Secretary of State Merlyn Rees raised the possibility of an arms amnesty with an SDLP delegation, but they told him Protestants would never hand in their weapons and said it was not the right time. According to papers held over from 1974, because they were being used by the Bloody Sunday Inquiry, Mr Fitt, in a meeting with the NIO, raised the question of alleged anti-Catholic bias in elements of the RUC. In another idea ahead of its time, a Stormont official, Michael Cudlipp, suggested a major campaign to "clean up Ulster". 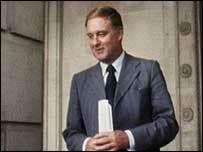 He referred to suggestions for morale-boosting events such as an Ulster Festival. He wrote: "For example, why not the big variety stars - Morcambe and Wise? Frank Sinatra? And the equivalent in cultural personalities. "They could provide concerts and we would try to persuade them to give their services free as part of an attempt to boost Ulster." He suggested these events might be hosted "on the lawns at Stormont". We may have to wait many more years to know whether Mo Mowlam was aware of this failed idea before succeeding in persuading the likes of Pavarotti and Rod Stewart to perform the very same function.